President Donald Trump said his party plans to woo African-American voters ahead of the contentious midterm elections next week, and that Democrats should be "worried." "I mean, we have the best numbers we've ever had. And I sometimes jokingly say, 'It's going to be awfully tough to beat me in a debate when I have the best numbers ever produced,'" Trump said Monday. "So I think they should be worried -- they should be worried about the African-Americans because they're going to lose them." Trump made the comments Monday night in an interview with Fox News’ Laura Ingraham, who asked him if his White House meeting with rapper Kanye West helped increase his poll numbers. 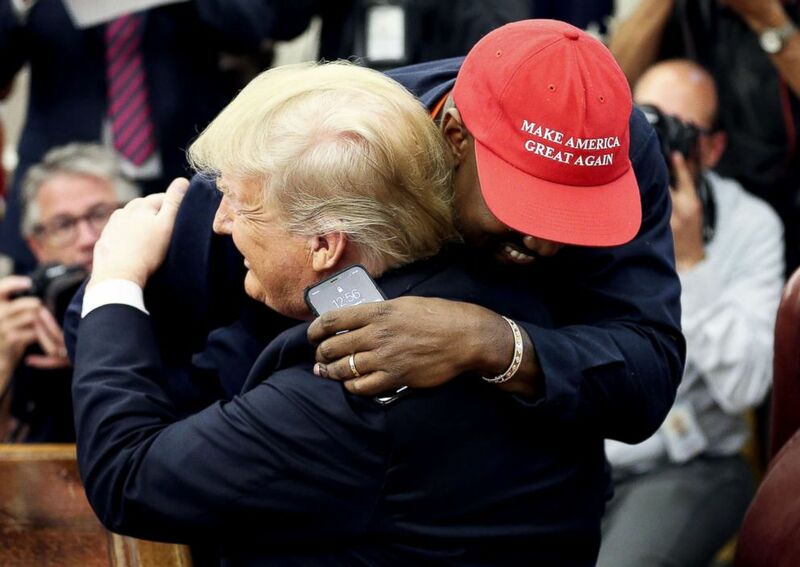 President Donald Trump hugs rapper Kanye West during a meeting in the Oval office of the White House on Oct. 11, 2018 in Washington, D.C.
"A person came into my office who does poll numbers and said: 'I do not believe how good these poll numbers are with African-Americans,'" Trump said. "And you see what's happened with my poll numbers. But here's what also happened. When we have the best employment numbers, the best median-income numbers, for all of these groups? I mean, we have the best numbers we've ever had." Trump often highlights his relationship with West as evidence that his political message is resonating with the black community at large. "It's habit because for a hundred years African-Americans have gone with Democrats, but now they're changing and they're changing fast and they're coming. Thank you, Kanye West," Trump said following his meeting with West earlier this month. Trump has been campaigning on behalf of Republican candidates across the country as his party fights to hold a majority in Congress. Democrats would need to win at least 24 seats to gain a majority in the House, where at least 41 Republicans are planning to retire, resign or run for another office, according to an analysis by ABC News. Trump would not comment on the specifics of his campaign schedule, but when Ingraham asked his if planned to hold "some events in the inner cities," Trump said: "I'm doing them, yeah. I already have them scheduled." Trump will hold 11 political rallies in eight states between now and Election Day, according to a source with knowledge of his schedule. 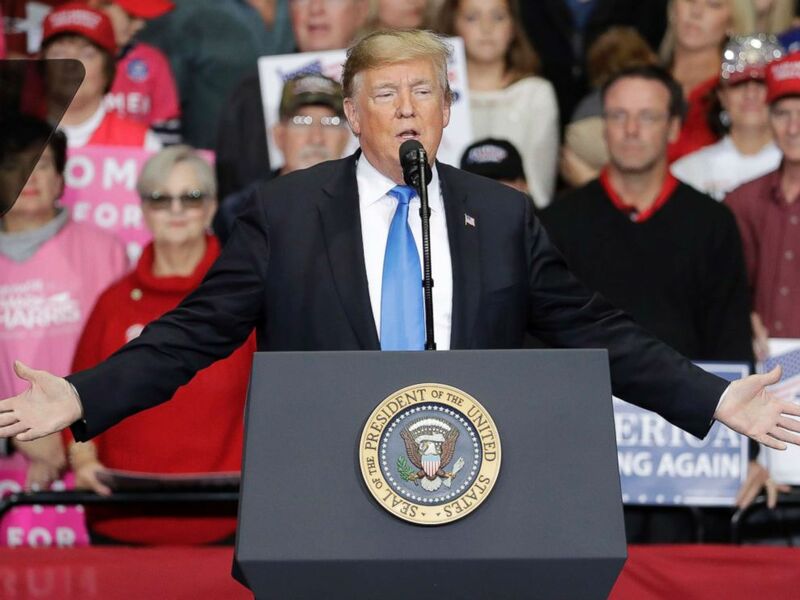 "By Election Day, the president will have hosted 53 rallies across 23 states since the start of the administration," a person familiar with the president's thinking said Monday. "Since Labor Day, the president has hosted 19 rallies and with 11 left on his schedule, the president will have led a remarkable 30 rallies after Labor Day." Trump will campaign in the following cities ahead of Election Day: Fort Myers, Florida; Columbia, Missouri; Huntington, West Virginia; Indianapolis; Bozeman, Montana; Pensacola, Florida; Macon, Georgia; Chattanooga, Tennessee; Cleveland; Ft. Wayne, Indiana; and Cape Girardeau, Missouri, according to a source with knowledge of the matter.